A one piece toilet integrates tank and bowl into a seamless design that is easy to clean. 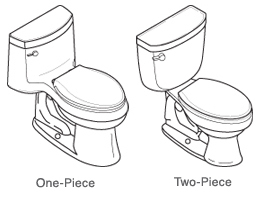 A two piece toilet features the traditional design of a separate tank and bowl. 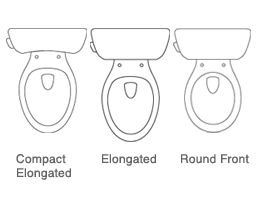 A standard height toilet bowl is about 14-1/2” and is also good for small children. 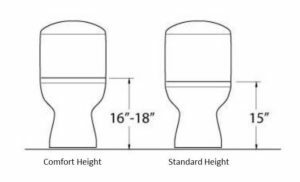 A comfort height toilet bowl is about 16-1/2”, which is about the height of a chair. Most people find it to be more comfortable and easier on the knees. An Elongated bowl is about 2″ longer then a round front bowl and provides added room and comfort for adults. Some manufacturers offer a compact elongated bowl, which will enable you to fit an elongated bowl in a tight space. A round front bowl requires less space, so if space is an issue this is your toilet and tends to be good for small children. Once you have figured out the type of toilet you want you need to figure out the flush. A gravity flush toilet is your standard toilet flush. An assisted flush toilet moves water from the tank to the bowl and out of the trapway using electricity or pressure. 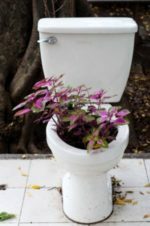 I have a pressure assist toilet and it can be a bit loud, commercial toilet sounding and when we first moved into our house my girls where young and refused to flush the toilet because it scared them. Some toilets offer a dual handle for your water gallons per flush option to save water and money. Touchless technology allows you to flush your toilet by placing your hand over the senor, thus minimizing the spread of germs around the bathroom.